MANILA, Philippines – Arizona Reid didn’t win the Best Import Award this time but it didn’t stop him in dropping 37 game high points to give the bleeding Alaska Aces another finals beating 103-95 on Sunday, July 12, 2015 at the Smart Araneta Coliseum in Cubao, Quezon City. 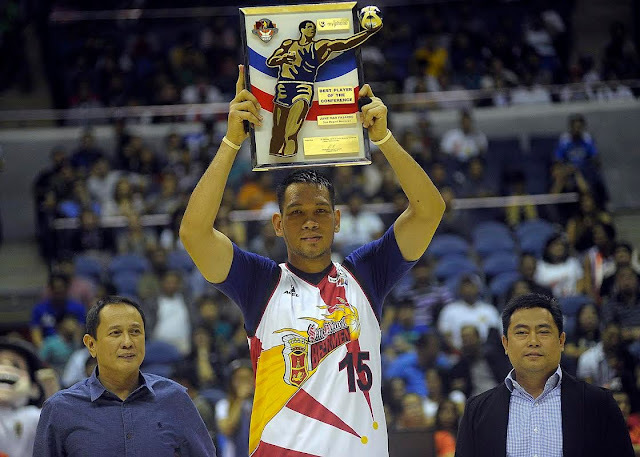 Before the Finals Game 3 started, Romeo Travis won the Bobby Parks Sr. – Best Import of the Conference Award edging out his championship rival Arizona Reid, Marqus Blakely and Wendell McKines. Meanwhile, Junmar “The Kraken” Fajardo won the Best Player of the Conference Award with 1,334 total votes from Media people and co-players beating Asi Taulava, Terrence Romeo and fellow Beermen Marcio Lassiter. Fajardo, who won his third BPC trophy, is also on track to win a second straight MVP. “It’s payback time!” This was Coach Alex Compton and his Aces’ battle cry for game number 2 after suffering a 30-point salvage loss from the hands of San Miguel Beermen. Sonny Thoss drew the first blood twice underneath the basket and was really looking sharp in atoning their lopsided loss. Cyrus Baguio and Romeo Travis gave their fair share for 10-2 run. Coach Leo Austria didn’t like the way his team started so he called an early timeout to wake-up his boys. AZ Reid and Marcio Lassiter responded to Coach Austria’s plea for quick 8 points combined. And just like that, SMB snatched the lead from the Aces 12-10. For the “nth” time, Coach Leo Austria used his unorthodox style of rotating his lineup. This time, he sent his reserved forward David Semerad to the floor and assigned him to guard Calvin “The Beast” Abueva due to court familiarity. Both Semerad and Abueva faced each other for at least 3 years in the NCAA. 2-time Best Import Arizona Reid might have lost the prestigious award but his goal on achieving his fist ever PBA championship remains. Reid, fired 14 early big points and gave the Beermen a slim 4-point, 28-24 lead after the first 12 minutes of the ballgame. Chris Ross who was a sleeper in the semis until finals game number 1 was ringing the bell from the downtown. Ross made 2 triples as the SMB started the 2nd period. It was a rainy and wet Sunday afternoon but San Miguel maintained their hot shooting hands behind the arc. SMB has already made 8 three-pointers from Reid, Lassiter, Ross and Lutz against RJ Jazul’s lone trey for Alaska in under 8 minutes of the 2nd quarter. Romeo Travis proved to the fans that he really deserved the Best Import Award by showing a very intense defense on the front court that limited the Beermen to shoot from the outside. Luckily for Alaska, after the hot start at the rainbow territory, SMB began to miss its 3-pointers until the end of the first-half. The Aces managed to trim the lead to just 3-points, 47-44 entering to the second-half of finals game number 2. Both team traded baskets at the start of the 3rd quarter. JV Casio nailed a floater plus a foul which tied the game 55-all. The penultimate quarter was really a dogfight between the two protagonists. It was a seesaw battle right from the start and terrific display of defense that resulted into a low scoring ballgame. A total of 6 deadlocks summarized the 3rd quarter to the tune of 73-73. Sonny Thoss schooled the newly crowned Best Player of the Conference with a sick reverse layup and a clear block. RJ Jazul matched Alaska’s biggest lead of 6 points way back in the opening period with three-pointer. Coach Austria burned another 30-second time out to reorganize his squad. The Beermen continued to miss from the outside that left Coach Austria no other option but to get the ball to Fajardo underneath the basket but “The Kraken” somehow failed to convert more than half of his foul shots. Finally, SMB connected as Alex Cabagnot and Marcio Lassiter launched long bombs to cut the lead to just 2 points 95-93 with 1:57 remaining on the game clock. AZ Reid made an easy 2-pointer for the equalizer and Marcio Lassiter made another long one for the lead, 98-95. The Aces had a chance to tie the game but Beemen’s defense was too tight in any angle of the floor. Sonny Thoss took the shot from a close range but missed bigtime. Junmar Fajardo grabbed the crucial rebound and got fouled by Romeo Travis to stop the clock. Fajardo sank both charities for SMB’s two-possession 100-95 lead. Coach Alex Compton designed a quick two-point play during his mandatory timeout but Travis felt confident on taking a three that went way short. AZ Reid placed the icing on the cake with 2 free throws, 103-95. The Beermen had a great night with 2-game advantage heading to game 3. Reid finished with a game high of 37 points and 7 dimes. Finals Game 3 will be on Wednesday, July 15, 2015 at the Smart Araneta Coliseum in Cubao, Quezon City.